Last Thursday Patti, Carolyn and I got together to brainstorm. We were trying to think of gifts to make that would be useful, quick to make and fun. The three of us own the Zutter Bind-It-All, so of course that became the tool of choice. I came home filled with ideas. It wasn't until yesterday that I put idea to action. I'm packing a box to ship to my over-seas family and I thought to fill the empty spaces I'd put these little books in. Each holds a 3x3 Post-It-Note pad. They are easy to re-fill. 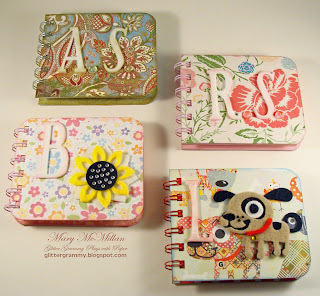 The little books are great ways to use up scraps. I used cereal boxes and shipping cartons to make the covers (cut 4x 3.5 inches) then covered them with scrap papers. I used my Spellbinder alphabet for the letters, cut from Fun Foam. The felt stickers are Woolies from BasicGrey. The chalks are from ColorBox. I bound them all using 1/2 inch Bind-It -All wires. These are definitely 20 minute projects.